It’s the first day of spring today and I know you are just itching for something to do in your home. Why not organize a closet? After all it is clean out your closet week. And because it is clean out your closet week I want to spend a few days talking about organizing different closets. Today I want to give you a few tips on organizing your clothes closet. You don’t know where to start you say? That’s okay. 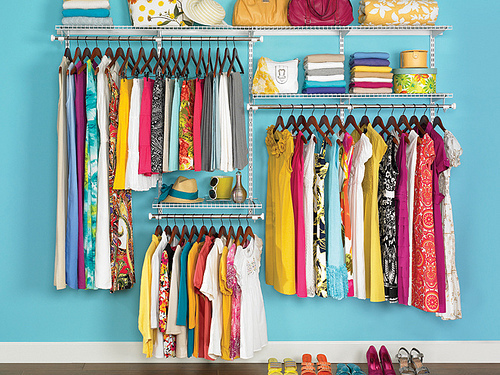 Start with a clean slate.The easiest place to start is by taking everything out of the closet. I like to start with a clean slate so that I know what I am working with. Sort & Purge. After that you want to sort and purge. Sort your clothing into groups and then go through and see what you can’t wear anymore, what needs to be thrown away all together or donated. Seasonal Storage. You also want to take this time to separate into seasons. It makes it so much easier. You don’t necessarily need another closet to keep your seasonal clothes in. I actually use large storage bins that I label with reusable labels and put my seasonal clothes in. I then can use the same bin to trade out each season. This has freed up so much space in my closet and my children’s closets and drawers. If you use plastic bins you can store those anywhere. Hangers, hangers, hangers! Make sure you have good hangers that are the same. Having different types of hangers can actually take up more space than is needed. Dresser Drawers Are Your Friend. If you have a dresser drawer that you use it is a good idea to only hang what is necessary. I like hanging blouses that wrinkle easy and dress pants and long dresses and certain types of skirts. Sweaters I usually keep in a drawer as well as jeans, but it is all about personal preference. The idea is to put as much as possible in drawers and hang the rest.